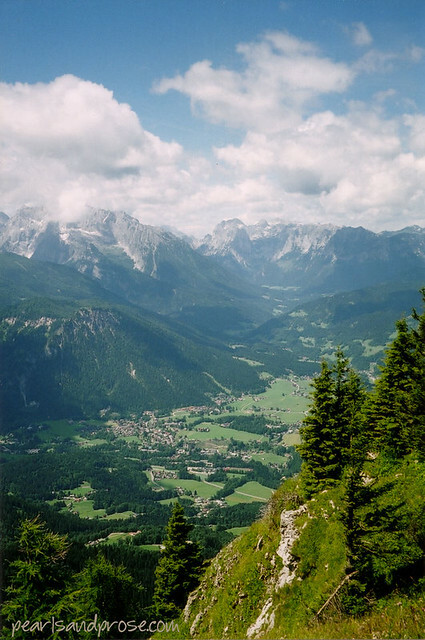 The bus ride up to Eagle’s Nest is positively hair-raising, especially if you don’t like heights. At one point there’s a hairpin curve and the bus wheels actually hang over the edge for a minute. Did the driver really need to tell us this? I was fairly green when I got off that bus. The body of water up towards the left? That’s the Königsee. You can see more photos here. If you go, don’t take the bus back down the mountain. 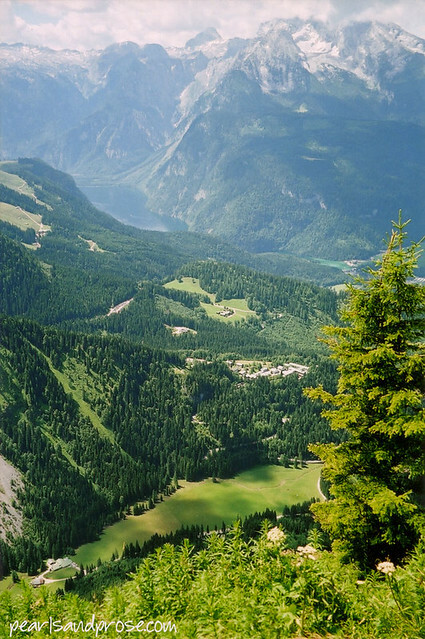 Walking is so much better–it’s like floating through the opening scenes of The Sound of Music. Which was filmed nearby. 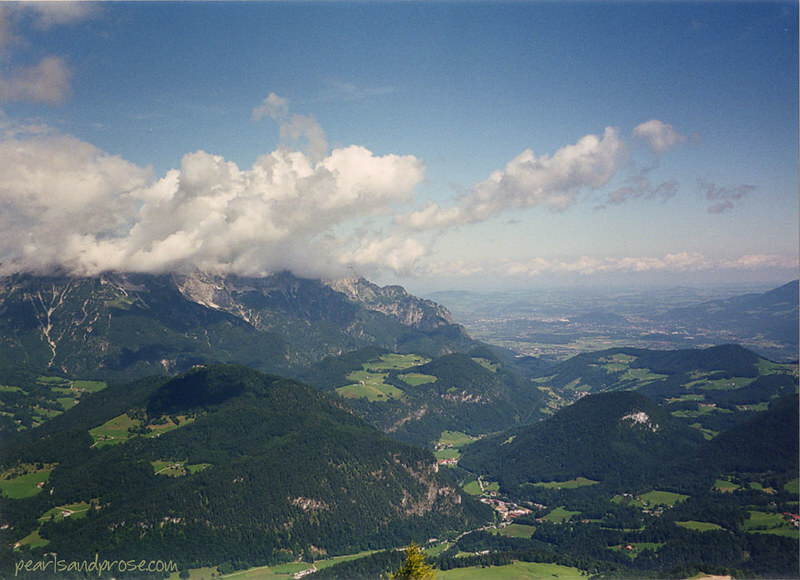 This entry was posted in photography and tagged Alps, Eagle's Nest, Obersalzberg, Southern Bavaria. Bookmark the permalink. Stunning scenery. I never thought of going there but it would actually be quite interesting. I think there is one episode of Band of Brothers set there. It’s even more beautiful in person, Caroline. I haven’t seen Band of Brothers in a long time, so don’t remember. The Winds of War was partly filmed there. Can I say “wow” about three times? Wow – that sounds like a crazy ride! 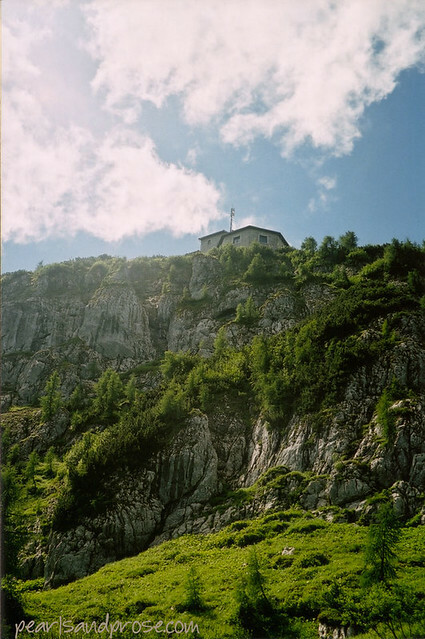 Wow – to be in Hitler’s retreat. Were his paintings there? 🙂 I don’t remember any paintings, but the fireplace was outfitted in Italian marble from Mussolini. The German tour guide made a point of telling us how Allied soldiers broke off pieces of the marble for souvenirs. I’ve read about this! Or perhaps I saw it in Band of Brothers? Cool! I may have to watch Band of Brothers again to see it. Wow what an amazing place…except the bus wheels not being on solid ground. That would terrify me. maybe they should tell you after the fact. Haha, yes. I wonder how many of us would have gotten off the bus if they’d told us before. Carole … these are spectacular images! So, did you walk down? Oh yes, there was no way I was repeating that drive down. I took the last photo from the path. Probably the most beautiful walk I’ve ever taken.